AMC’s sixth season of its massively popular survival series The Walking Dead may have left fans on tenterhooks with a real clanger of a cliffhanger, but if today’s first peek at season 7 is any indication, October’s batch of episodes won’t waste any time in rolling out the answers. 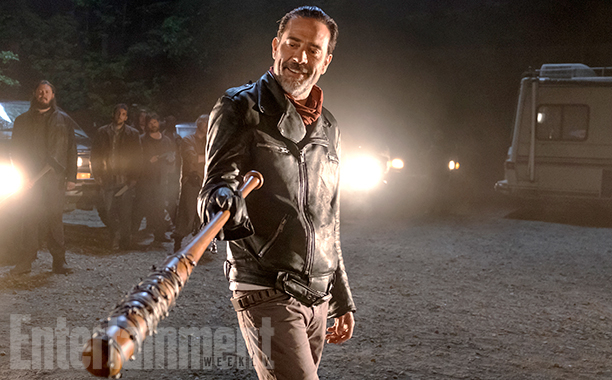 Set to claw its way back onto the airwaves on October 9, Entertainment Weekly has unveiled the first image for The Walking Dead season 7, and unsurprisingly, it places Negan in the limelight once more. Going one step further, and now that Morgan’s vile character has secured his status as a series regular, AMC is primed to delve deeper into the fractured psyche of Negan – replete with rambling, disconcerting monologues. The Walking Dead season 7 will premiere on October 7.